Are You Ready for a Smart Safety Boot on the Jobsite? Now that nearly everyone has a cell phone, we’re entering a world where every single inanimate object has to be connected to the internet or Bluetooth. In the past, we’ve talked about Bluetooth enabled tools, a smart hard hat, and even a smart safety vest that can send alerts if objects are approaching to quickly, among many others. We recently came across another piece of construction related Internet of Things (IoT) objects, a safety boots, thanks to Conexpo-Con/Agg’s blog. 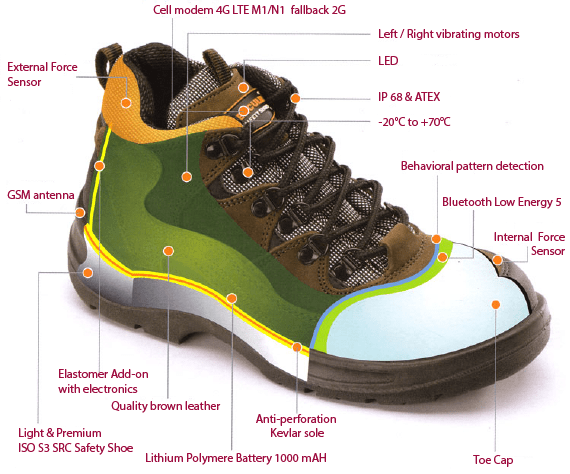 Intellinium, a French company, has developed a “smart & connected safety shoe,” which can be used to alert workers of hazardous conditions or allow the worker wearing the boot to send for help, all with the tap of a toe. Alerts and messages are sent by the boot wearer using a derivative of MORSE code or through the use of a smartphone app. The boot itself features an internal sensor and an external sensor for acknowledging and sending alerts, so if the wearer’s leg or foot is injured, their hand is still able to reach down and activate the external sensor. Intellinium touts the fact that the user does not need to use hands to interact with the device as a difference maker amongst other smart PPE. The boot is equipped with a system of vibration motors, a 90dB buzzer, and LED lights which allow the wearers to communicate with each other. It appears that in order to benefit from all of the boot’s features you would have to purchase the boot from Intellinium, but they do also offer a “lateral flexible casing,” which can integrate some of the features into the boots the worker already owns. In that situation, the internal sensor, which would allow hands free use, would not be available. What do you think? Can you see yourself or your company wanting or needing this on a job site? Tell us in the comments below!